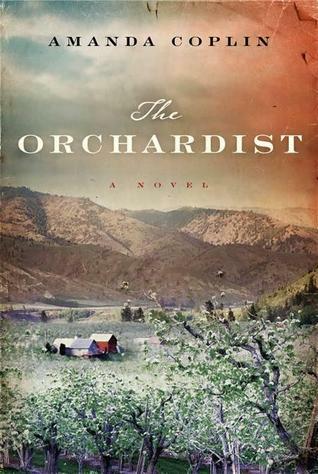 The Orchardist: A Novel, by Amanda Coplin, is definitely a book that inhales and exhales nature and environment. The historical information is compelling and well written. Washington State is described vividly, as far as apple orchards and farming is concerned. The production of apples, the selling of them, distributing them, etc., are presented in fine detail. The environmental and geographical aspects are written with almost poetic visuals, and with environmental loveliness. But, poetic loveliness is not to be misconstrued in the aspect that the novel is a dark and disturbing one on many levels. I found the writing style to be unique, and my eye caught the author’s lack of using quotation marks for dialogue. At times I had to reread sentences to make certain I was reading dialogue, and not another expansion of a sentence. With that said, I had no difficulty once I adjusted to the fact. For a first novel, I was extremely impressed with the writing and illuminating word-imagery, especially concerning the orchard. The minute details did not detract from the story, in my opinion. I felt those details were a part of the whole spectrum of the issues that were dealt with. I thought Coplin’s use of planting, growing, tending, and nurturing crops as an analogy for the human spirit was brilliant. Yet, I also thought the novel could have been shortened by about 100 pages, as it stands, it is over 400 pages in length. Nature versus nurture has always been a topic within some circles regarding bringing up children. The Orchardist gives the reader a clear example of that effort, on the part of Talmadge, the orchardist, and his attempt to raise two children, Jane and Della who have fled an abusive relationship, one lived in a brothel where their lives depended on giving sexual favors. They appear in his orchard, two young girls, each one pregnant. Jane eventually gives birth to a daughter named Angeline, and Talmadge raises her like his own child. To say more regarding the girls would be to give away too much information. Fear, loss, love and separation, abuse and trauma, and so much more are encompassed within the pages of The Orchardist. Their lives become entwined, and their orientation, or disorientation to the world is strongly pronounced within the pages. The book is quite existential, as far as individualization of the characters. The reader is taken through their lives and their personalities and their essences are vividly portrayed. Confusion, indifference, harboring emotions, etc., it is all apparent as Talmadge, Della and Angeline forge ahead with their lives, some times complacently, at other times on a destructive journey. If you are looking for a fast-moving read, this book is not for you. The book is depressing in many areas, and not really one for those seeking a “happy and/or inspirational” reading experience. Amanda Coplin does an excellent job of emphasizing those subjects. For a first book, I thought it was brilliant in many areas. If I were to rate the book, I would give it a 3.5 on a scale of 1-5, with 5 being the highest. Stolen Voices: Young People’s War Diaries, from World War I to Iraq, by Zlata Filipovic, is an incredible testament to war, written through the eyes of the youth of past generations. I was impressed by the various individual writings, and how their thoughts and feelings filled the pages of the book. From the United States and Russia, to Lithuania, Poland, Israel and Iraq, to mention a few, the diary entries give the reader a harsh look at war, and how it affected those young people in ways we can not begin to imagine. Fear is an understatement to their mindsets. Aside from the cultural aspect, the innocence of youth shines through. Yet, so does the questioning and wondering illuminate. So many questions, unanswered, and the answers still are unanswerable, today. The tragedies forced upon children and young adults of all backgrounds, with no borders left out, is intensely written. The sadness and worry, the fears and anxieties are vivid depictions, depictions no young person should have to endure or be subject to. The youthful writings are not only filled with fear of the known and unknown, but fear for their family members. The writings are indicative of youthful dreams and hopes, youthful insecurities amidst an environment of hardships unimaginable. Starvation, poverty, living conditions, survival and more were at the forefront of their minds. The human condition with all of its indignities, and how society treats those who are downtrodden or selected for abuse is prevalent. It is an eye-opener to read what these young individuals, from varied backgrounds and cultures, wrote regarding war and its affects. I highly recommend Stolen Voices: Young People’s War Diaries, from World War I to Iraq, by Zlata Filipovic to both the youth of today and adults of all ages. There is much to be learned through the eyes of the young…the maturity level was beyond their years. I feel that this poignant book belongs in every personal and public library. “Rutka’s Notebook, A Voice From the Holocaust“, is a personal accounting, taken from the diary of Rutka Laskier, a Polish teenager. She wrote her diary beginning at the age of 14, and it spans approximately three months of her life, beginning January 19, 1943. Rutka describes, in depth, her fluctuating emotions during the time period, and her diary reflects the ups and downs, the roller coaster of emotions, that most teenagers feel. From typical feelings of love and jealousy, to familial discontent, to the German occupation, Rutka defines life during the Holocaust through her eyes and voice. Yet, those emotions and her thoughts are coupled with the fact that she is astutely aware of the Holocaust and its ramifications to humanity. Rutka’s writing gives voice and witness to the realities of the Holocaust. Rutka wrote her thoughts and emotions in her diary, and told her non-Jewish friend, Stanislawa Sapinska, to find it and save it, if and when, Rutka and her family were moved from their apartment in Bedzin to the Ghetto, or if they were deported. There was a predetermined hiding spot. After the war ended, Sapinska returned to the apartment, and located the diary. She held on to it for sixty years. Sapinska’s family convinced her to show its existence. Rutka articulates her thoughts and emotions like that of a more mature person, and not that of a young teenager. She is aware of the consequences that could occur, and is aware of the brutality of war, having witnessed some horrors within the confines of daily living. I recommend this historical book to everyone, young or old, alike. “Rutka’s Notebook: A Voice From the Holocaust” is an amazing accounting of daily life, of the struggles and fears lived every hour of each day, and of the knowledge that one may not live to see the end of war. It is a testament to her strength and willpower, that Rutka Laskier had the foresight to want her diary preserved for the world to see. She wanted the truth to be told. It should be on a bookshelf in every school classroom, not only for its extreme historical value, but also so that Rutka Laskier’s life will not be forgotten in the time continuum. The introduction was written by Rutka Laskier’s half-sister, Zahava (Laskier) Scherz. A family biography at the end of the diary, itself, was also written by Scherz. The Family: Three Journeys into the Heart of the Twentieth Century, by David Laskin, brings the reader a compelling look at the choices we make, and how those choices affect our lives, and the lives of our family members. From the Russia Empire, Israel and America, the journeys taken are cohesively written, with word-imagery that fills all of the senses. The reader garners glimpses into the past that combine social, ethnic and familial aspects. From revolution and war, striving to survive under extremely harsh and horrific conditions, emigrating and assimilating, the details depicted are written brilliantly. Laskin’s arduous research shines through the pages. It is not just his family’s story, but everyone’s story, everyone interested in history. The Russian Revolution, and how it affected Laskin’s family, is described in minute detail, with nothing left to the imagination. The struggles to begin anew in a harsh desert land is so descriptive, I could see the environment before my eyes. I could feel the intensity of the heat, and the wind blowing sand everywhere. The family’s assimilation into American life is told masterfully, illuminating their struggles to earn a living, cope, and be seen as a part of the whole. Learning to act like American was not an easy task, from dress to speech to mannerisms, it took effort to be accepted. It took perseverance and determination to be successful. One family member was so successful, and as a female in a world of male business professionals, she outshone them. the author’s Aunt Itel knew she was the best at what she did. She was confident and was able to achieve what others dream of. Her strength and fortitude led her to found the Maidenform Bra Company. Who would have thought that in 1922 this was possible! World War II had a major impact on Laskin’s family. The events are tragic, and affected family members in ways that one would not expect. There were times I caught myself teary-eyed through Laskin’s beautiful prose. His sensitivity to the subject matter was most definitely apparent to me. Yet, through the sensitivity, his forthrightness leaves the reader cognizant of events that they might not have otherwise been aware of. What an amazing writer and what an amazing story! The family/ancestral history is a wonderful tribute to those whose lives came before the author, David Laskin. Just as important are the profound historical facts depicted within the pages. 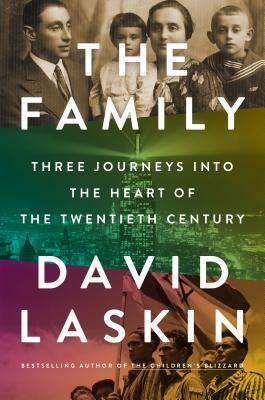 The Family: Three Journeys into the Heart of the Twentieth Century, by David Laskin,is a book of extreme historical importance, in my opinion. I highly recommend it to everyone. Life After Life: A Novel, by Kate Atkinson is a book with an interesting take on immortality. Not that reincarnations or parallel lives are an unusual subject for a novel, but in the aspect of Atkinson’s depiction of it through the lives of Ursula Todd, it can infer so much more. Ursula comes to life on many occasions, and at first it took me a three chapters to understand just what was occurring. That realization, in itself, was not a negative thing, but the constant reinforcement of Ursula’s situation/s left me wanting more than reiterations. I felt as if I was in the midst of an offshoot version of the film, Groundhog Day. Ursula’s life begins and ends, only to begin again in continual renewal cycles. For me, that about sums it up. Life after life, Ursula is recycled, again and again. Parallel lives, reincarnation, metaphysics, whatever you wish to call it, it is there, unending. The repetition became boring after a while for me, and the book is a long one with over 500 pages. I felt it tedious and to be challenging for me to finish the book. I became tired of the jumping back and forth in time, place, life, and situational occurrences. Finish it, I did, though. With that said, the word imagery was excellently written, as well as the historical events. Kate Atkinson accomplishes that with clarity and strength. Atkinson’s writing depicting twists of fate and time bring unusual actions that Ursula involves herself in. She does weave the decades into the pages with a lot of history, which breaks up some of the repetition. I get it, I really do, but totally enjoy it, I did not. Did I enjoy the book, overall? Not really. I was disappointed, and thought all of the hype surrounding the book was overrated. That is just my opinion. Yours might differ, and therefore we can agree to disagree. On a scale of 1-5, with 5 being the highest rating, I rate this a 3. I am a E.L. Doctorow fan. 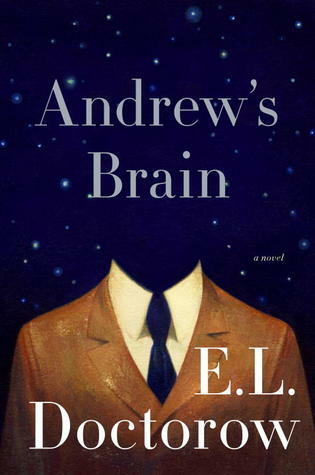 I was anxious to read Andrew’s Brain: A Novel, his latest book. From the first to the last page, the story was a multitude of confusion, confusion as in one individual’s brain and mindset. The brain is a mysterious organ, one that dictates our body’s responses, perceptions, thoughts, emotions, actions, etc. This is brought to the forefront within the pages of Doctorow’s book, which is really a study on the mechanics of the brain, and in particular, a man named Andrew. Andrew spills his thoughts, both real and imagined, created and remembered, to a psychiatrist. The reader is exposed to all of his ramblings and rantings, that run rampant throughout the pages. His past traumas are depicted, along with his views on relationships, memory, responsibility, and love and loss, as they flood the pages, a raging river of neurons and synapses. His manipulations are strongly illuminated, and maintained in order to deny responsibility and in order to infuse the mind of others. The reader is taken on a roller coaster ride, one that delivers and in depth look at the ups and downs of a disturbed mind. I am not a scientist-cognitive or otherwise, am not a doctor, but have had experience with others who have been diagnosed with Post Traumatic Stress and how it can invade the thinking of an otherwise normal individual. I have (past tense) been involved with someone who has a mental disorder. I know how that disorder basically rendered them incapable of emotion, responsibility and incapable of leading a “normal” life. Andrew’s Brain is a difficult read, and not overly easy to follow. I had to retrace a few pages to make certain I was digesting the concept correctly. Aside from that, in my opinion, E.L. Doctorow is masterful with his writing and word images. His exploration and insight is astute, all-encompassing, and brilliant. He delivers, full scale, on the thought processes of the fractured and diseased mind. For that reason, I recommend Andrew’s Brain. I have purposely left out the characters and the plot line, as it would basically spoil the story.